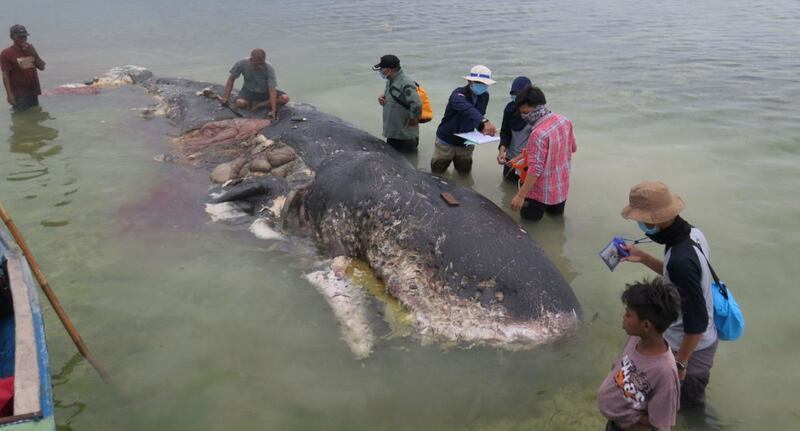 A dead whale has washed up in Indonesia with more than 1,000 pieces of plastic in their stomach. The 31ft sperm whale was found in Wakatobi National Park, Southeast Sulawesi on Monday. They had 115 plastic cups in their stomach, along with 25 plastic bags, four plastic bottles, two flip flops, and more than 1,000 pieces of debris and string, weighing almost 6kg. "If nature had a distress signal to warn us that it can't take any more of our plastic rubbish, it would look like this - a dead whale with 1,000 pieces of plastic in its stomach," added Greenpeace UK Senior Oceans Campaigner Louise Edge. Indonesia, one of the world's worst plastic polluters, is reportedly trying to reduce its plastic waste by 70 percent by 2025. This death follows a June incident when a pilot washed up dead in Thailand with 80 pieces of plastic rubbish in their stomach.